Bruce Power and the County of Bruce have had a collaborative working relationship since the company was formed in 2001. This has included investments in key community initiatives; regular and ongoing communications; emergency preparedness initiatives; engagement on regulatory items, physician recruitment partnerships and most recently on Economic Development and Innovation. In 2016, Bruce Power and the County of Bruce launched a regional economic development initiative, in response to Bruce Power’s multi-billion dollar, multi-year Life Extension Program. The Initiative’s focus is on the nuclear industry – expanding nuclear supply chain businesses into the region while building the regional network and community capacity to support and sustain this long term growth opportunity. Since the launch of the Initiative, the region has seen an increase in its permanent local nuclear supply chain presence – with over 30 suppliers located in the region with job creation targets of over 300 in the next few years. Many are world leaders in the nuclear industry, relocating top-talent and key executives into the area. More information on the initiative can be found at www.brucepower.com/suppliers. With an increased presence of the local supply chain and a concentration of world leaders in the nuclear industry located in the region – we have established a nuclear energy economic hub. As a result, there is significant opportunity to harness the talent, experience and expertise and innovation in the region. 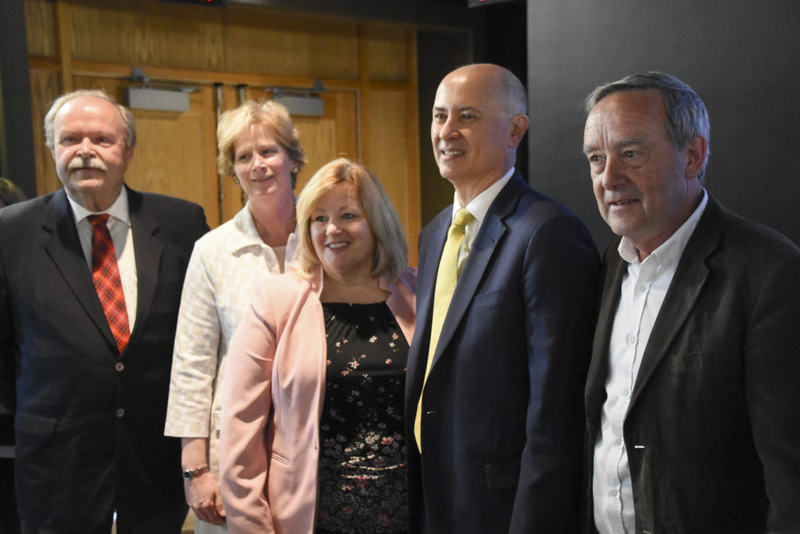 On May 16th, 2018 Bruce Power and the County of Bruce announced a new partnership to establish Ontario’s Nuclear Innovation Institute (NII). The purpose of the Institute will be to consolidate many existing activities that will advance the work of each partner. For Bruce Power the main focus is to develop future innovations and partnerships to enhance key areas of Bruce Power’s operations including safety, reliability, efficiency, productivity and project execution. For Bruce County, the Institute will serve as physical space to support and enhance innovation and in-career trades and skilled workforce development and business incubation and acceleration. Photo: Bruce Power and the County of Bruce have partnered to establish the Ontario Nuclear Innovation Institute as an international centre of excellence for applied research and training. Making the announcement are Paul Eagleson, left, Warden, County of Bruce; Kelley Coulter, Chief Administrative Officer, County of Bruce; Lisa Thompson, incumbent MPP, Huron-Bruce; Mike Rencheck, President and CEO, Bruce Power; and Mike Smith, Mayor, Town of Saugeen Shores. The Planning & Development Team is currently working to solicit expertise from key partners and domestic and international organizations to guide the formation of the Institute during the development phase of the project. Our goal is for the Institute to operate as a stand-alone entity to be established with its own Governance structure, business plan and appropriate partnerships. For clarity, this will include a separate legal operating entity with dedicated human resources for ongoing operations and a Board of Directors to oversee its function, separate and distinct from Bruce Power and Bruce County.